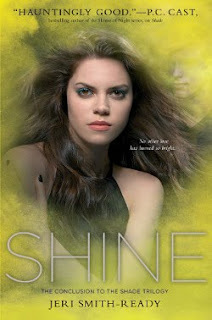 Jeri Smith-Ready: How do I get an ARC of SHINE? Can't wait to buy my copy! Cannot wait! This series has been amazing, Jeri. Thanks for your note. Haven't had a chance to respond yet. WOW! So amazing! I hope Aura wins the heroine tournament! kyaaaaaa!! THanks for all the chances to win an arc! yey! Thanks, everyone, and good luck! Will you be doing a release tour? You need to come to (or near) Michigan! I would also *really* like an omnibus or special edition boxed set, wink, wink. I filled out the form, but I will be buying a copy as well!!! Thanks Jeri :) and I can't wait to read the final installment, aaaahhhhh. Heather: Well, like most authors, I have to pay for my own travel, so I don't really "tour" per se. This year other than MD and PA (where I have family), I'll be in Chicago and Minneapolis, and at BEA in NYC.